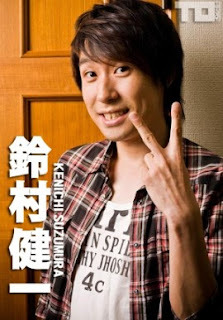 unleashthegeek: Seiyuu Suzumura Kenichi no longer with Arts Vision? Seiyuu Suzumura Kenichi no longer with Arts Vision? Seiyuu Suzumura Kenichi (D.Gray Man's Lavi, Daily Lives of High School Boys's Yoshitake) is rumoured to have left his talent agency, Arts Vision and gone freelance. His name is no longer listed in their roster. His Biscuit Cafe Blog under Morinaga which started in October 2008 was last updated by him on 27th March and by Morinaga staff on 30th March. The staff thanked everyone for their support and offered a limited-time download for a screensaver program developed in collaboration with Suzumura. The blog will then close down at the end of the download period, 27th April. There is speculation that he will not stay free for long and will join AXLONE, an agency set up just a year ago in April 2011 by seiyuu Morikawa Toshiyuki. Morikawa himself was formerly from Arts Vision. The current stable of male seiyuu in AXLONE's roster; Sugiyama Noriaki, Tachibana Shinnosuke, Terashima Takuma, Hino Satoshi, Fukuyama Jun and Mizushima Takahiro were all formerly from Production Baobab and feature prominently in otome and BL works, as is Suzumura.